One Direction can easily be labeled as the biggest boy band of our generation. After their short stint on X-Factor UK, the boys quickly climbed the charts to become one of the hottest selling pop groups of the past decade. Their superstar good looks and fit vocals gave them a smattering of female (and male) fans the world over. 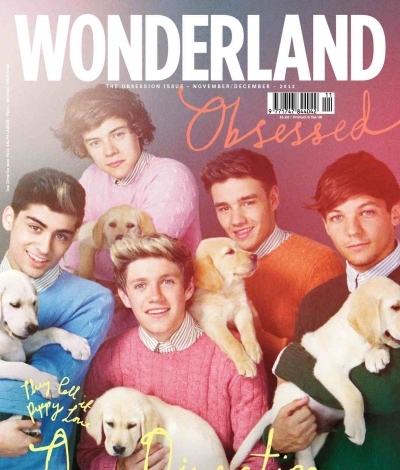 The latest One Direction photo shoot places the singers on UK’s Wonderland magazine, but they’re not smizing (smiling with their eyes) with slicked back hair, they’re posing with – wait for it – puppies. If the cheese factor went any higher, these guys might be facing death by cottage cheese. Puppies, One Direction, and 50’s inspired photo shoots? It’s like a stairway to heaven for prepubescent teenagers. Take Me Home will be released internationally on the 13th of November – this will also be the day that the world ends.